This 3″ ornament is the perfect way to celebrate Christmas and get in the holiday spirit. Add the holiday joy to your Christmas tree. The perfect gift idea to brighten up someone’s holiday, this one of a kind ceramic ornament is sure to be featured at the very front and center of any tree or other holiday display year after year. This ornament comes with a stylish gold string securely fastened to the top making it easy to hang on the tree or around the house for everyone to see. Make your Christmas tree great again with our Trump ceramic ornaments. So, if you’re a person looking for a unique holiday ornament that will be forever memorable, the “Trump Ceramic Collectibles” is the answer you’ve been looking for! Enjoy! 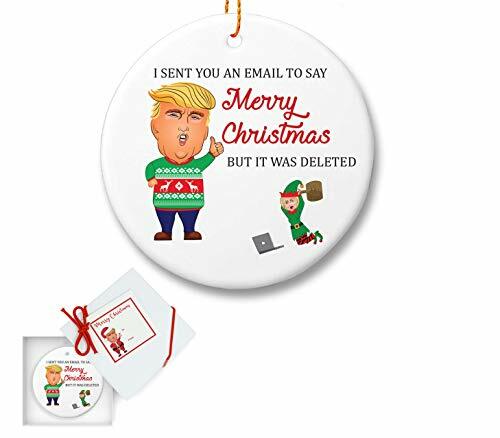 MAKE CHRISTMAS GREAT AGAIN! Get the best 3 inch. Christmas Ceramic Ornament. Our designs make a unique and unforgettable tree ornament that becomes treasured keepsakes. This ornament will bring laughter to anyone who sees the designs. BEST ORNAMENT! One of the best holiday gifts is to create laughter & fun for family, friends, or colleagues. Trump ornaments is permanent fused, made with Grade- A ceramic, so they can remain pristine for many holidays to come. Vibrant and sharp images. NO RUSSIAN INTERFERENCE! Russia had nothing to do with the making of these Christmas Ornaments. Great ideas only come from the good ol’ USA. READY FOR GIFTING! Each ornament is bubble wrapped then carefully placed in a sturdy gift box to ensure safe arrival. Comes with a bonus red ribbon & hand lettered gift tag. EXCEED ALL EXPECTATIONS- Your satisfaction is our top priority. FOLE’s “Trump Ornaments Collectibles” are backed by 100% satisfaction guarantee. We are always here to help.